You should at some point realise the significance of your birthdate. 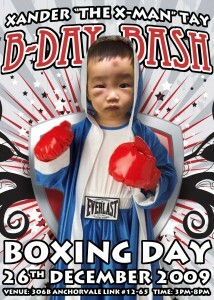 Of course, not only is it Boxing Day, it is also the day after Christmas, and also falls within the December holidays. This is all good… on the surface. Because as you grow older each year, you may come to realise the drastic drawbacks this birthdate will have on your wanting to celebrate it. Before I go into the technical issues with your birthdate though, we feel you should know the technical issues leading up to your birth. Your parents would like to clarify one thing: the fact that your birthday falls on the day after Christmas was your choice, not ours. When the gynecologist told your mum and me that your expected birthdate would be on 26 December, within 17 seconds both of us were already hatching a plan to try to get you out on Christmas Day instead (after running it through with the ob/gyn, of course). You being in your mother’s belly in the ensuing months is probably the most wonderful feeling your mother will remember for the rest of her life, but the tail end of her being pregnant with you wasn’t something I’d forget anytime soon either. Close to midnight of Christmas Eve 2008, I drove your mother to the hospital on my barely 2-week-old driving license (I figured as a father-to-be, the least I could do was learn to drive a car and drive your mother to give birth to our firstborn son, rather than, you know, take the bus or something), and in the hospital, your mother was prepped with labour-inducing drugs. Your mother started contracting in a couple of hours. By then it was already Christmas, and our hope grew with each passing hour. And then Christmas went. The look of disappointment in your mother’s eyes was heart-wrenching, but we soon focused on just having you out safe and sound. 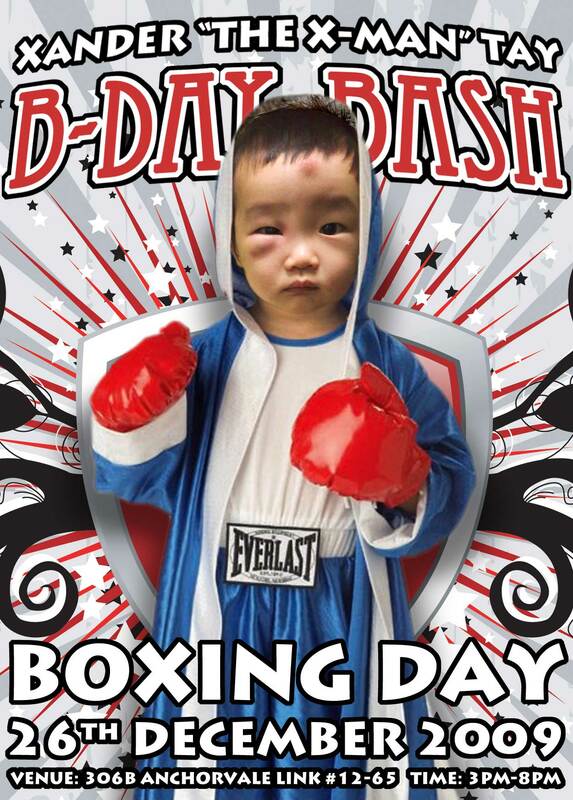 We had hit Boxing Day, and your head was barely peeking through. The nurses had been coaching your mother through pushing you out. After a while of intense huffing and puffing and trying to blow you out, you were still contentedly just airing the top of your head, so at 2.45am, the doctor ordered forceps to try to extract you out of your mother’s womb, but then you were in an awkward position and the forceps couldn’t be inserted properly without poking your eye out (not the doctor’s words); so much for that idea. At 3.30am your mother was wheeled into the Operating Theatre for a C-section and at 4.30am, I managed to stay conscious long enough to see you born. That’s 30 long hours for us to get you out, going through every standard birth procedure in the book (induced, natural, assisted and Caesarian) and slowly realizing the lesson you were teaching us: that you were coming out on your own terms, not ours. Since before you came out till now, both your mum and I have pondered the implications of you being born in possibly the most party-prone holiday period of the year, not to mention the one holiday when celebrations run akin to a gigantic birthday party for any country in the world that has a healthy retail industry. The fact that you eventually chose to miss that by a day kind of just makes it worse, you know? For starters, you need to know it takes not a little effort for your middle-income parents to throw 2 celebrations in 2 days. To that end, our plan to mostly get away with it consists of attending someone else’s Christmas party and then throwing you a birthday party the next day. If we’re really financially strapped, we may even attend 2 Christmas parties and tell you one of them is your birthday party, but on the latter idea, you’ll probably see how the issue of sincerity may play against you. And then there’s the presents. A few years from now, you’re going to find some people in your life cheaping out and giving you just the 1 present on the presumption that Christmas and your birthday are a combined entity. Your mum and I don’t want yo to be shortchanged, so we try our best to ensure everyone who wants to give you presents knows to get you 1 for Christmas and 1 for your birthday, but should you encounter anyone who is hoping to sneak by with counting 2 thoughts into 1 present, Dad’s gonna teach you what to say to these people: tell them you were born on Boxing Day, not Christmas, so you are entitled to go Muhammad Ali on their red and white bottoms if they think they can sneak a 1-for-2 combo on you (mum is signing you up for Taekwondo classes next February). While we try to take care of your Welfare during these 2 days every year, there’s unfortunately more bad news. Your birthday also happens to fall deep into the end-of-year school holidays. While you’re probably not going to feel it now (your current daycare centre/school is open throughout the year), once you reach primary school, you’ll find those mini-birthday celebrations your classmates are going to have in class during schooldays won’t be happening with you. Your dad fully understands your predicament; I was born in November. Every year from when I was four until I turned 19, just as I was about to happily tell my friends it was my birthday, school would shut down for the rest of the year; it’s like you’re working right up to the point of the climax of a sneeze, and then… you don’t. Possibly the final blow would be when you and your friends reach drinking age and beyond. The day you chose to be born being the day after Christmas, there is a high likelihood of your friends nursing hangovers from the previous night, therefore rendering any notion of a birthday celebration right after Christmas quite moot. The widespread post-Christmas hangovers don’t last long though. Depending on the tenacity of your friends’ perception of their youth, the phenomenon may last anything from 2 years to 25 years. If you have any friends who still exhibit post-Christmas hangovers past age 40 though, maybe you should refrain from inviting him or her to your birthday party (your parents being the exception, of course). There is one perk to having your birthday on the 26th of December: it’s real easy to remember. And since remembering that is easy, we ask that you also remember this: your mum and I will always be trying to make your birthday your birthday.